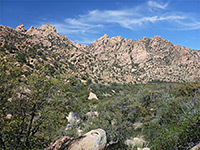 Outcrops of eroded, rounded boulders feature in many places across the Southwest, in such diverse locations as Joshua Tree National Park and Pinnacles National Park in California, Granite Mountain in north Arizona, and Hueco Tanks in Texas. Another, not so well known location is Cochise Stronghold in southeast Arizona, part of the Dragoon Mountains, which are a relatively small range, extending north-south for 20 miles, between the wide expanses of San Pedro Valley to the west and Sulphur Springs Valley to the east. 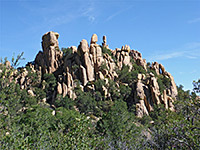 Most of the hills are traditional in appearance, with wooded, rounded peaks and ridges but at the Stronghold, over an area approximately 2 by 3 miles, the underlying brownish granite is largely exposed, and weathered to form a varied array of domes, fines, pinnacles and boulder piles. All the mountains are part of the Coronado National Forest. The many narrow ravines, sheer cliffs and other hard-to-reach places made this an ideal refuge for the Chiricahua Apache Indians and their famed chief Cochise, who dwelt here for several years in the 1860s, following the battle of Apache Pass. Cochise is buried amongst the rocks in an unmarked location that was known only to his immediate family and friends, and is now thought to be lost. Today, the two main activities at the Stronghold are hiking and camping. The rocks may be accessed from the east or west side of the mountains, but the east is the usual approach; the access road leads to a peaceful campground set amongst oak trees at the foot of the hills, from where a 4.5 mile trail climbs over the crest to the west entrance, passing right through some of the formations though the main area lies a little way off-trail to the north. 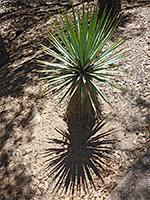 The vegetation is varied, reflecting the location on the edge of both the Sonoran and Chihuahuan deserts - trees and bushes mingle with many wildflower species, grasses and a range of cacti, yucca and agave. The mountains are an example of a sky island; an isolated, high elevation area, surrounded by larger expanses of desert lowlands, and they are home to a wide array of species including some found nowhere else. The place is also known for rock climbing, bird watching and horse riding. The less used western trailhead to the Stronghold may be reached by several unpaved roads including Old Ranch Road from the north (starting at Dragoon), FR 687 from the south, starting along Middlemarch Road, and Stronghold Canyon Road, the main route, from the west (from Saint David). 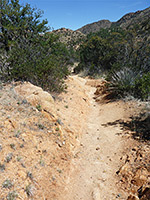 The three routes meet near the edge of the mountains and the latter continues 3 miles along a valley to the trailhead, but this section is rough in places and generally requires a 4WD vehicle. In contrast, the eastern approach is suitable for all vehicles, even quite large RVs. This is via Ironwood Road starting from US 191 near Sunsites; the road is dead straight for 5 miles, crossing flat, sparsely-settled land, to a junction with Cochise Stronghold Road, this providing an alternative, northwards approach, from the vicinity of Dragoon. Beyond the junction, Ironwood Road, now gravel, continues west a short distance across even emptier land, past a few side tracks to potential free camping places, and also several residences, then bends south and enters the wooded valley of Cochise Creek (Stronghold Canyon), which also contains a few houses, and other buildings. The road is bumpy where it crosses the streambed (five times), but the amount of water is usually very low, and there should be no difficulties in reaching the campground, where the road ends. One short side road leads to Kerwin and Carlink canyons, two wooded, trailless, steep-sided ravines also within Coronado National Forest, but most people are here for the Stronghold. The campground is a quiet and peaceful location, suitable for RVs up to 30 feet long, as well as smaller vehicles, and tents. All is shady, set amongst large oak and pine trees, resulting in only dappled sunlight on the forest floor, and limited views of the mountains, but the place is very popular, and may fill up at weekends during spring and fall. The camp is open all winter but closes for three months in summer, when high temperatures make hiking less enjoyable. The sites are quite close together. Fees are $10 per night, $5 for day use or hiking. The 0.4 mile Stronghold Nature Trail loops across the slopes bordering the south edge of the campground, and has notices identifying some of the common plants, while the main hiking path - the 4.5 mile Cochise Trail - branches off to the south.